Trucking Companies U.S. Xpress, Inc.
OTR Drivers: 844-274-6240 Lease Purchase Drivers: 844-279-2431 Dedicated Drivers: 844-279-1528 Apply Now! 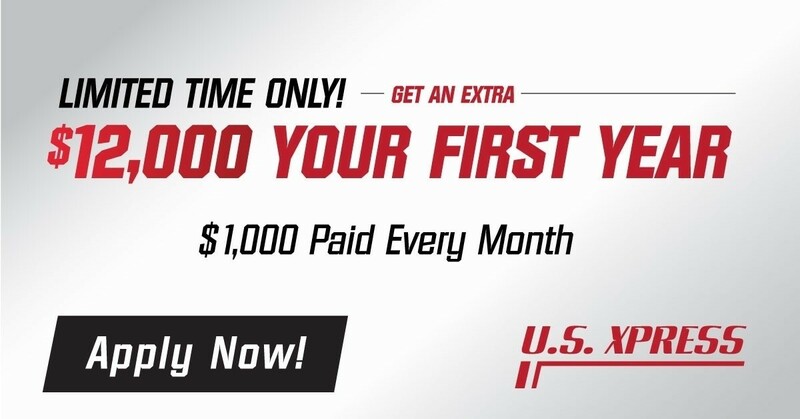 Truck Driving Jobs at U.S. Xpress, Inc.
Solo and Team Drivers - Own Your Own Truck with our Lease Purchase Program. Now Hiring in the Tennessee area! With one of the largest fleets in the nation, the newest technology, and the newest trucks, US Xpress has successfully built a culture of family, safety, and innovation. By joining our team, you have the opportunity to grow your skill set and be a part of the top family-owned and operated business in the transportation industry. We recognize how important you are to keeping our fleet rolling and ensuring we deliver excellence. That’s why we offer a highly competitive compensation package, including a technician sign-on bonus, boot allowance, and tuition reimbursement. If you are driven to passionately pursue your goals both professionally and personally, we want to meet you! When Max Fuller and Patrick Quinn founded US Xpress in 1986, they began with a modest fleet of just 48 trucks. More importantly, they brought a fresh, new perspective that emphasized custom solutions and personalized customer service, delivered by insightful and motivated experts. This new way of thinking quickly resonated with customers. In fact, just one year later Inc. magazine hailed US Xpress as one of the fastest-growing privately held truckload carriers in the country. Our leadership was also eager to harness the power of technology for the good of our customers and our employees. US Xpress was one of the first truckload carriers to fully integrate satellite communications aboard the fleet. Also, we were proud to be early adopters of such life-saving technologies as roll stability, disc brakes, and accident avoidance systems. In addition, US Xpress’ fresh perspective included leading the industry in “thinking green.” We were awarded for the second time the SmartWay Environmental Excellence Award for reducing pollution and greenhouse gasses. By staying true to our core ideals, US Xpress has achieved exponential growth. In fact, we surpassed $1 billion in annual revenue faster than any truckload carrier in history. In the process, our fleet has grown from those original 48 trucks to 8,000 state-of-the art vehicles. And the innovative spirit that first launched US Xpress is now fueled by over 10,000 solutions-minded problem- solvers—including a new generation of Fullers and Quinns. So no matter what new challenges the future may bring, U can count on US.